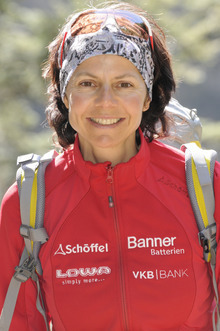 Gerlinde Kaltenbrunner is a professional mountaineer out of passion. She lives in Upper Austria and whenever she finds the time, she is out rock climbing, mountaineering in the Alps or on expedition. Gerlinde Kaltenbrunner trained as a nurse and after a short intermezzo as a sales representative in the outdoor industry, she took the courage and embarked on the unstable career path to become a professional mountaineer. Today, she has all 14 8,000m-peaks under her belt. By reaching the summit of the 8,611m-high K2, she became the first woman to scale all 8,000m-peaks without the use of supplemental oxygen and high altitude porters. Up until now, Gerlinde has always talked about her most thrilling experiences on 8,000 metre-peaks, giving us a good insight of how she climbs these high mountains. In her latest presentation, Gerlinde presents us with a different side of the tallest peaks as this time she takes us on a compelling and extraordinary journey through her 20 years of expedition life. She gives us a close account of the trials and tribulations, but also the beauties she encountered on her long way to these fascinating giants. By introducing each section with a short video clip, Gerlinde openly talks about her deepest emotions and experiences. She demonstrates what the mountains have triggered inside her during the past two centuries; and tells us how her values, such as willpower and discipline, trust and patience as well as intuition and enthusiasm, have evolved over the years. Repeatedly going back to the overwhelmingly beautiful nature of the Himalaya and Karakorum, these values have become her purpose in life and, consistently implemented, have led to her success. In this way, the mountains have become her mentors. Hi, thought this Lecture may be of interest http://www.wildernesslectures.com/speaker.php?id=242 ----------------------------- Up until now, Gerlinde has always talked about her most thrilling experiences on 8,000 metre-peaks, giving us a good insight of how she climbs these high mountains. In her latest presentation, Gerlinde presents us with a different side of the tallest peaks as this time she takes us on a compelling and extraordinary journey through her 20 years of expedition life. She gives us a close account of the trials and tribulations, but also the beauties she encountered on her long way to these fascinating giants. By introducing each section with a short video clip, Gerlinde openly talks about her deepest emotions and experiences. She demonstrates what the mountains have triggered inside her during the past two centuries; and tells us how her values, such as willpower and discipline, trust and patience as well as intuition and enthusiasm, have evolved over the years. Repeatedly going back to the overwhelmingly beautiful nature of the Himalaya and Karakorum, these values have become her purpose in life and, consistently implemented, have led to her success. In this way, the mountains have become her mentors.